One of the things I love about theatre is that it isn’t a solitary activity. It can happen only when a group of people with a range of skills work together to achieve a shared goal. Some of those people are really visible in that process: they get to take a bow at the end of the evening, or get their names on the poster. Others are behind the scenes: they may be the person who builds the set or looks after the accounts. The role each member of the company plays is crucial and yet no one person can put the show on alone – without the plethora of skills, talents and interests that the people around them have, there would be no production or, if there were, it would be a poorer, less well-executed one. There’s been so much talk about the lack of diversity in theatre recently, but to us under-represented artists this is not news. We’ve been shouting about this for decades, so it’s ironic that it takes Andrew Lloyd Webber to say something for people to take notice. It seems you have to be part of the white, privileged establishment to make any changes or to be heard in the first place. At Rifco, I have been making theatre that reflects the experiences of, and resonates with, contemporary British Asian society for more than 17 years because of a real lack of working-class British-Asian stories from inside the community. We tell stories from an authentic British Asian point of view in a way that is accessible to the very audience we are talking about. Our plays and musicals have engaged British Asian audiences all over the country, who want to see themselves on stage, as they are. Not only as terrorists, slumdogs, doctors and maids, but also as dysfunctional families, desperate singletons and Bollywood drag queens – as real people. By doing this, Rifco has been filling theatres across the country with a new audience that come in their thousands, as well as engaging a traditional theatre audience who want to see unique new voices. When I visit theatres around the UK, I see many struggling to be more diverse. Some resort to tokenism – often, you will see a poster with one black actor in a sea of white actors with an entirely white creative team. Don’t just tick that box and slap yourselves on the back. There is so much more to do. There is a lack of knowledge or expertise on how to approach diverse audiences. So the approach becomes one-dimensional, mostly putting on what is known, an English classic play or musical with a sprinkling of brown people, often not in the lead parts. Diverse casting is a step in the right direction, but if the playwright and the director (and usually the creative team) are white, the point of view will be too. So why would the audience be any different? I’m not rubbishing the casting of diverse actors in traditionally white roles, but this is not enough. Don’t just tick that box and slap yourselves on the back. There is so much more to do – particularly on leadership. Where are the diverse leaders in theatre? Madani Younis is doing amazing work at London’s Bush Theatre to support important new voices. He doesn’t have to think about being diverse in his building, it’s a natural part of what he does: making the Bush relevant and accessible to the huge multicultural audience on his doorstep and giving platform to some amazing artists. This is London, but where else in the regions is this happening? Many UK theatres are run by middle-class white men. What are they doing to find out what their local working class, black, Asian or Chinese community want to see? I often hear: “We tried an ‘Asian’ show once and it didn’t work.” But a Tabla recital on a Tuesday night may not be what your local audience wants to see. For many years we have had to convince heads of marketing that Rifco can reach – and sell to – audiences the mainstream theatre world doesn’t even know about. We are experts at making work that talks to the British Asian community. This is often met with resistance, even when we can show them the figures. Why are we not met with the same excitement as other white-led touring companies? Why do we have to prove ourselves every year? There are many reasons why ‘people of colour’ are angry. Now there is a new phenomenon to contend with: ‘pretend diversity’. In my opinion, this is a modern equivalent of blacking up, because the core of the business remains the same. 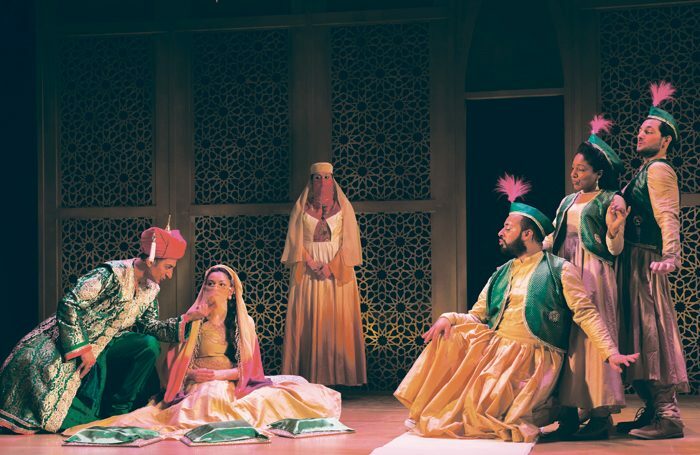 Some theatres receive special acknowledgement because they have let a few disabled people into their studio and once put on a cultural event for Muslims in their foyer. Have they invested in productions led by diverse artists or welcomed diverse audiences into their main stage space with relevant work? Have they really put diversity at the heart of the programme and the theatre? I would like to break a myth: diverse theatre does sell. Rifco has proved that. I was fortunate to have one of India’s iconic screen and stage actresses, Shabana Azmi, play the lead in Harvey Virdi’s play Happy Birthday Sunita in 2014. When we were booking the tour, many of the programmers didn’t know who Azmi was and refused to take the show. The tour played at 92% with sold-out performances and did very well at the box office. I would not have had the same issue if Meryl Streep were in the cast. I would like to break a myth: diverse theatre does sell. It should not be seen as any more risky than any other theatre product. Rifco has proved that, in a positive and committed venue partnership, box office numbers will grow with both new audiences and traditional theatregoers who want to see unique new work. Year on year, the audience for our mid-scale work is growing: in the past three years we have doubled our audience and it is hungry to see more work by more diverse companies. Rifco moved into Watford Palace Theatre and became the resident company in 2011. Artistic director Brigid Larmour and I decided to work together in a partnership that started with understanding what we both do well as artists and companies. Brigid has been generous and embedded us in every aspect of the building. It feels like home and the people in it are our family. I am given the space to create new work on the main stage with all the support of an in-house production. Rifco’s team brings a unique artistic voice and the culturally specific skills and experience in developing the audience. Over the past five years, there has been a huge impact on our core audience at Watford Palace Theatre. Britain’s Got Bhangra (2011) was our first co-production, with 2,240 audience members. More recently, Laila – The Musical (2016) achieved audience figures of 4,054 in the same two-week slot, an 80% increase since our first show. Through this partnership, we have been able to grow our audience, increase our artistic ambition and strengthen our brand as a leading British touring company. If there is to be change in the next decade, it has to be at the front line. Until the leaders in the sector become the very people we want to represent in our theatres, this will not happen. It is time to admit the current model of enticing the white establishment to become more diverse has not worked. Rifco is looking to the future and we are supporting new and mid-career British Asian artists with our Rifco associates programme. We work with up to six British Asian artists each year to support their chosen theatre path. We work across art forms to encourage theatremakers and other creative voices such as set designers, musicians, comedians to make new work supported by a bespoke mentorship programme. Most recently, stand-up comedian and actress Sukh Kaur Ojla has come through this process with a strong debut play, Pyar Actually. Rifco has also been developing its own artistic journey and unique offer. Our latest production, Virdi’s Miss Meena and the Masala Queens, is about British Asian drag queens, looking at the lives of these female impersonators and the issues within a British-Asian context. Masala Queens was the hardest tour we have ever booked. Even some of our most committed theatre partners questioned booking it because they felt it was too risky (being both brown and LGBT). But looking at a snapshot of the box office today, it has the best pre-sales we have ever had. Only a few years ago, I would not have been able to programme such progressive work because the core audience may not have come on this journey with us. In the past 17 years, I hope we have done enough to encourage them to come to the theatre to be challenged and as well as entertained. At its heart, this is a new British work and relevant to all theatre audiences. It is always a difficult balance to stay relevant to the under-represented audience we want to serve, but also accessible to more general theatre audiences. The solution is to encourage diverse artistic voices in theatre buildings and make them an important part of business, rather than an add-on or an afterthought. We must give real leadership opportunities to diverse artists and allow them to take the entire organisation on the journey. If we don’t do this, the theatre ecology will not grow in an inclusive way and will not be future-proof.